The amount of operating energy available from recoil depends 011 the particular cartridge used and on the weight of the recoiling parts. The use of a powerful cartridge will result in a high total momentum imparted to the projectile and powder gases and the corresponding reaction will produce a high momentum of the recoiling parts. However, the velocity of recoil will depend on the weight of the recoiling parts; the greater the weight, the lower the velocity. Since the kinetic energy of a weight is directly proportional to its mass and the square of its velocity, the net result is that the energy contained in the recoiling parts will be inversely proportional to their weight. In other words, increasing the weight of the recoiling parts will not change the momentum imparted to them but will causc a decrease in both the recoil velocity and the recoil energy. Thus it is evident that the weight of the recoiling parts has an important eflect on the performance of a rccoil-opcratcd gun. All of the kinetic energy imparted to the recoiling parts is transferred to them in the period of less than 0.01 second during which the pressure of the powder gases is active. 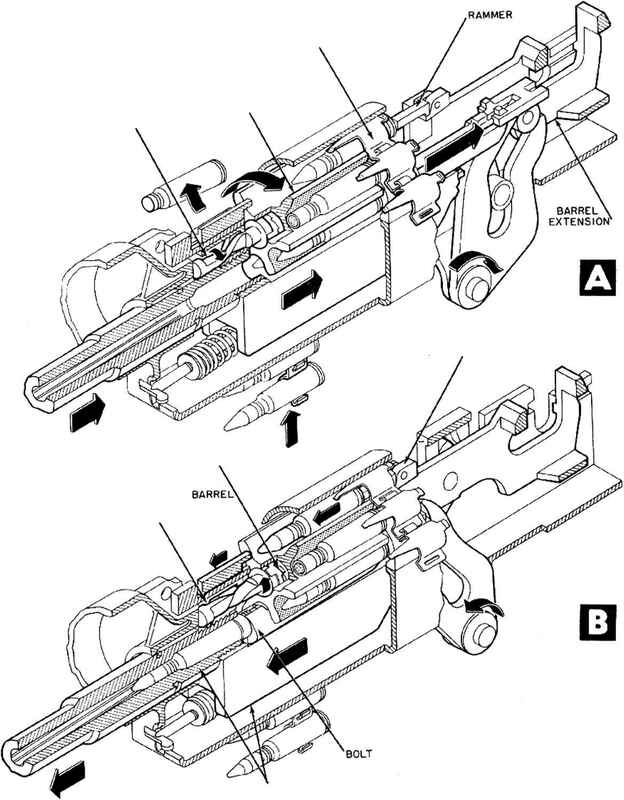 After this time, the parts continue to move (if their own momentum and their energy is transferred to the gun mechanism for performing the various operations required in the automatic cycle. In various types of recoil systems, the energy may be employed in different ways. These systems will be described and analyzed in the following pages.